The blokes from Australia, the Newsboys, have been in the music news quite a lot recently, mainly with the announcement that long-time lead singer Peter Furler decided to step down from the band. He is expected to take on more of a producing position, with the acclaimed Michael Tait from dc Talk fame filling in on the microphone. 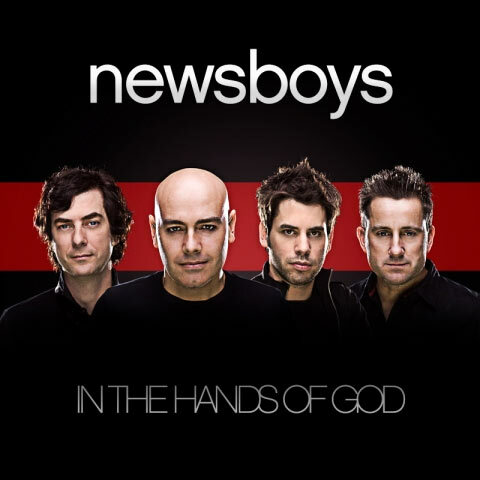 Like it or not, Peter will no longer perform live with the legendary pop act, but amid all this news, the Newsboys are releasing their follow-up to Go, entitled In The Hands Of God. Thankfully, Furler is still featured on vocals, though it is the Newsboys' first studio album without Phil Joel on the bass (since he joined up for Take Me To Your Leader in 1996). This being the group's fourteenth album, the result is surprisingly a mixed bag. The album begins with the energetic opener "The Way We Roll." Some may legitimately claim this song to be too similar to "Wherever We Go" from Go; indeed, it's almost the same message. Using imagery ranging from the band's humble beginnings to their superstar status today and crediting the Lord for their success, this one ends up becoming a contemplative song, which is appropriate for this release given how long these guys have been around. Following "The Way We Roll" is "No Grave." This song really shows the serious side of the Newsboys, and it's possibly the best track on the record. A mature and welcomed addition to the Newsboys' list of hits, it's different and unexpected from these veterans, and that's something to be welcomed knowing how many years they have been in the business. In these last few years, it's become a trademark of the Newsboys to include at least a couple of worship songs on every release, and In the Hands Of God is no exception. "Glorious" is a great original, acknowledging the Lord's greatness in light of our personal failures. The title track is in the same vein, which discusses how we can rely on God in times of trouble. These two tracks are destined to follow the same path as that of recent worship hits "I Am Free" and "It Is You"; don't be surprised to hear them played at churches nationwide soon. "Lead Me to the Cross" is the one cover song on the record, originally done by Hillsong United. Given the fact that there are only ten songs on the album, it's a bit saddening that the band resorted to using a cover song to top off the track listing. Sure, the track is done well enough, but that leaves only nine all-new songs on In The Hands Of God, which, considering how legendary these guys are at songwriting as well as performing, is a little disappointing. Speaking of disappointing song choices, "This Is Your Life" and "My Friend Jesus" prove to be the most surprisingly lacking tracks on the record. Just like Switchfoot's song of the same name, "This Is Your Life" urges listeners to "treat yourself and others right" and to "do what you know you should." While these lyrics ring true, I can't help but be slightly unimpressed with the lack of lyrical sophistication on this track that the Newsboys are known for. "My Friend Jesus" is just plain odd, and that's saying a lot when it comes to the Aussies (anyone who has heard "Shine" knows exactly what I mean). It follows the tale of a disgruntled consumer calling technical support only to fly into a rage when he's put on hold multiple times. It's a very different track compared to the rest of the record, and though it may have been successful in being different, it wasn't necessarily different in a good way. The album closes with "Dance," a trance-influenced electronic track, and finally "RSL 1984." This album seems to begin and end on the contemplative side, with both tracks relating the band's past and journey together with a thankful note. As the fourteenth album from the band, it's an appropriate start and finish to the album. Though this is quite a minor complaint, I have to mention the minimalist cover artwork. The Newsboys have always been creative with this aspect of each record, but here, it looks thrown together with little care or thought put into it. It merely features a red stripe behind four headshots of the band members (which was a shot released earlier this year with the announcement of Jody Davis returning to the band, minus the red stripe), and comparing this with any of their past albums' covers, it's disappointingly uninteresting. This album marks the end of a chapter in the Newsboys' career. With Furler's departure, all of the band's original members have now been replaced at some point during the band's run. Though it's not a terrible record by any means, it's just not on the same level as some of their previous work. While the bittersweet In The Hands Of God is quite a respectable effort from the Aussies, we've come to expect a little more.